The mountains of the Monte Rosa massif are absolutely spectacular. So given another chance (vacation all of last week! ), I went back. Luckily, I have two trusty skiing companions ready to jaunt down to Alpes whenever they are need: Audun and Dad. After a day of acclimatization around Zermatt, we headed back into the real mountains, this time Täschhütte in a different valley. The day was foggy and the snow cover sketchy lower down, so the 1100 vertical was a long slog. On the way up we crossed the debris of several very large avalanche, confirming our good decision not to ski in the day before. After a quiet supper with the hut's four other guests, we headed for bed early. In good alpine style, we would be starting the next day at 4.30 am. Although I consider myself a morning person, 4.30 is stretching it for me. The reward is beautiful morning light. Sunrise on Weisshorn, taken while waiting 45 minutes for Audun to find his sunglasses (which where hanging on his backpack). We headed off on icy snow up the valley, the sun finally hitting us as we reached the glacier. Our goal for the day was to try and summit 4199m Rimpfischhorn, and then continue on to Britanniahütte on the other side of the mountain. 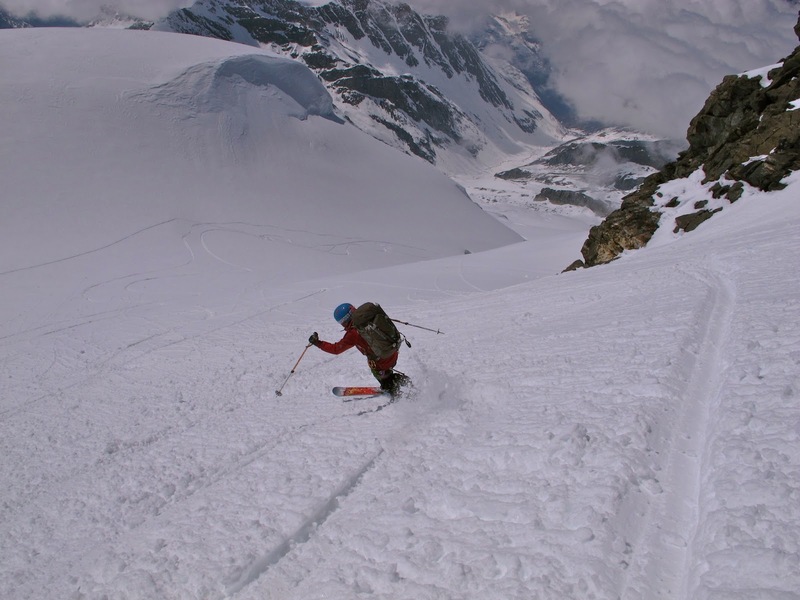 The ski up to the glacier was nice and mellow, and we roped up as the climbed steepened towards the saddle. Audun leads up the glacier, in the tracks of two groups ahead of us. We reached the saddle past 1pm, due to our 'late start' at 6.45am (re: Audun spends almost an hour looking for his sunglasses!) The last 200 vertical take you up a steep, rocky spire to the top, and we saw some of the other groups high above us. Even though it was late, we decided to take our skis off and attempt the climb. 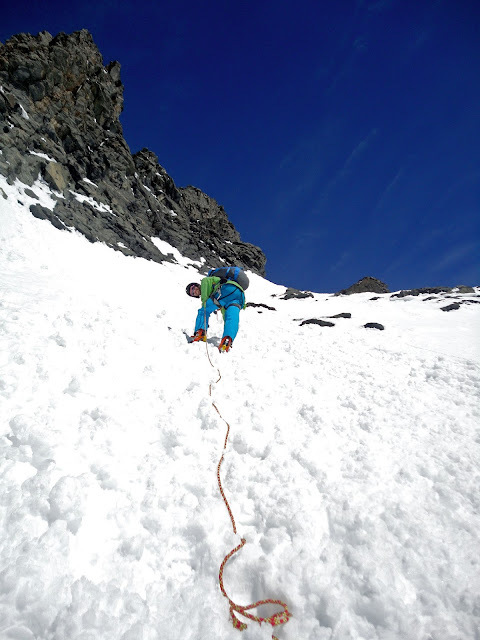 To make a long story short, we ended up turning at about the point were the climb turned from 'steep snow' to 'rock climbing'. I didn't like the loose, afternoon snow nor the steep slope, and we thought the climbing section would take too long given our experience. We figure our high point was at about 4100m. The ski down the glacier was enjoyable, even if I was a little worried about hidden crevasses. The rest of the ski into became kind of a slog, as we had to put our skins on twice more (to make a total of 4 times for the day) before we pulled in at around 5.30pm. We were all tired after a really long day, and decided we wanted to 'take it easy' the next day. Unfortunately, at Britanniahütte they come into your room at 4.30am and turn the lights on. So no sleeping in there! Strahlhorn (right) and Fluchthorn (left), bathed in sunrise. It's amazing how little I was able to eat at 4.45am the next morning. I just sat and stared at my breakfast, finally choking down a single piece of bread with jam. And two cups of coffee . We headed out at 6.30am, still later than most guests, into the morning light again. 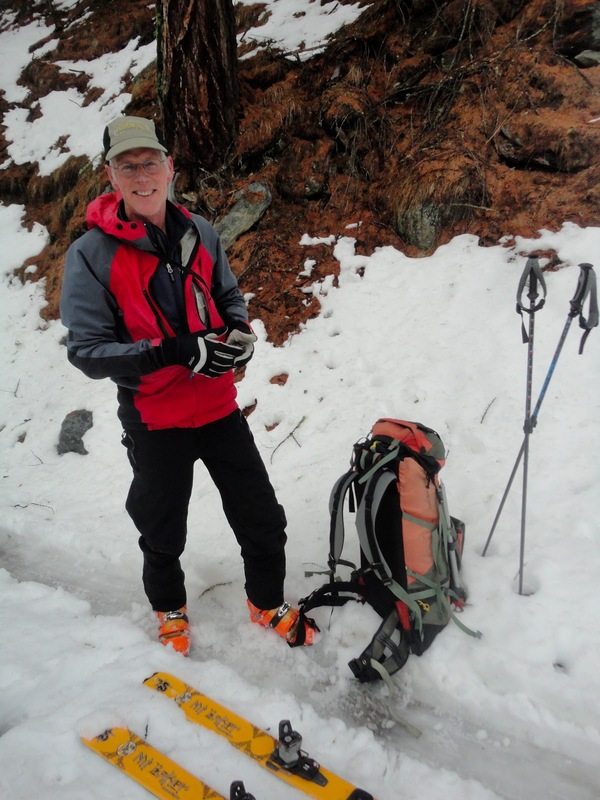 We climbed about 800 vertical to reach the top of sub-4000 Fluchthorn. I was feeling sluggish in the morning, but perked up as the top grew closer. Victory on Fluchthorn. Italy is covered in clouds (Picture by Dad). We took a steeper route down from the top and found untouched powder, which can be difficult at a time of year when wind and sun evolve the snowpack so much. Success! The next day we decided to go for Strahlhorn, a very popular peak to climb from Britanniahütte because it's an easy 4000m - no climbing involved! This turned out to be a big challenge for me, because I was fatigued from the 4.30am wake up calls and days of skiing at altitude. It took me a while to 'get my motor running', but stubbornness wins out in the end, and we reached the top at around 2pm. Dad heads up the glacier in the morning light. After 3 days of gorgeous weather, the forecast called for changing conditions and so we decided to ski out to Saas Fee and relax in Grenoble for the last day of the trip. A bumpy ski out to the valley and 6 hours of train finally brought us to the long awaited shower. And it was heavenly. This weekend, me and a team of 4 Frenchies (Romain, Nico, Sylvain and Fabien) will be participating in the Grenoble INP Raid. 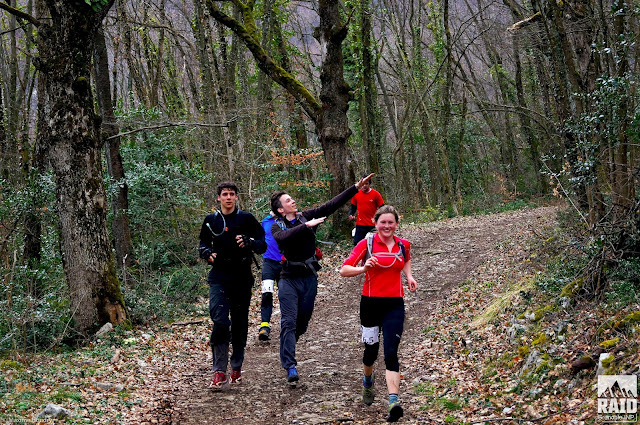 As far as I can tell, 'raid' is French for adventure race, which is a code word for 'we shall send them out into to the mountains and have them do a bunch of different sports until they are very tired'. It's going to last all weekend, and I really don't know what I'm getting into. Which should be great fun! We had to qualify for the Raid by completing the Prologue about a month ago. It involved mountain biking and running. 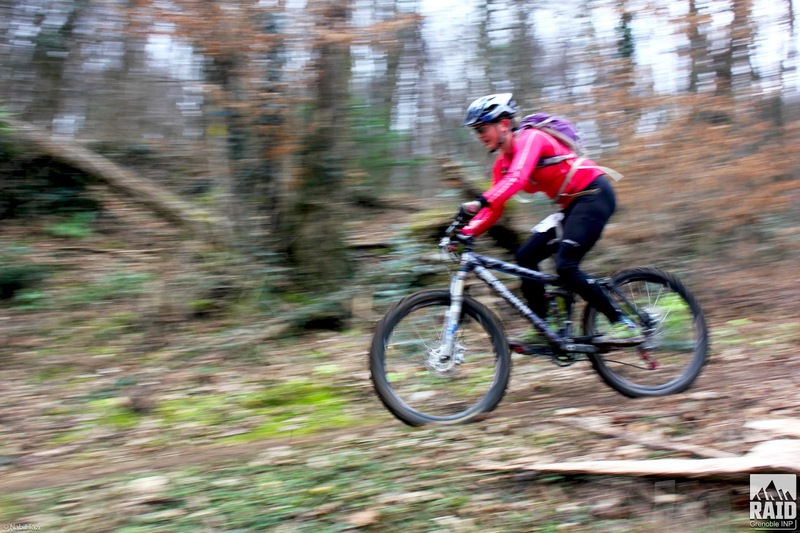 It was the first time I've raced my mountain bike, and I thoroughly enjoyed it. Since the prologue, I've biked a lot but haven't run much, so it will be interesting to see how this weekend goes. Rumor has it there will be swimming too. Hi, I'm new to your blog. It's great. Beautiful photos. Makes me want to go climbing! Thanks, I'm glad you enjoy it :) I try to update about once a week, so keep coming back!